These decadent cakes are full of rich chocolate flavor! They can be made ahead of time, making them the perfect dessert for your Valentine’s Day dinner. With just a kiss of raspberry in the center of each cake, Miniature Chocolate Raspberry Cakes will be sure satisfy your Valentine’s Day (or any day!) sweet tooth. To make the truffle mixture, put the chocolate with the butter in a bowl over a saucepan of gently simmering water, without the water touching the bottom of the bowl. Stir the mixture gently until melted and smooth. Let cool a moment; then, stir in the raspberry jam and the Framboise. Chill until firm. 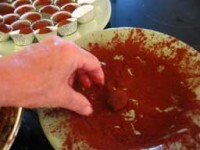 To form the truffles, strain the cocoa into a flat plate. 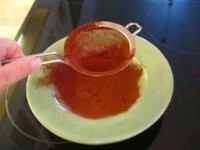 Scoop out a teaspoon of the mixture, with your fingers press it around a fresh raspberry, and drop it into the cocoa. 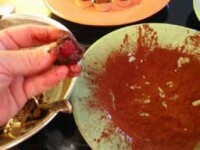 Roll it around in the cocoa, and lift it with your fingernails to transfer it to a little candy cup. 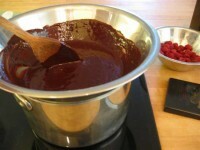 Repeat with the remaining chocolate mixture and raspberries. Serve within 24 hours.